In 1947 the Golden Gloves amateur boxing tournament brought out 13,176 into the still new Memorial Auditorium. The Courier Express, which sponsored the tourney, claimed the championship bouts set an early attendance record for the Aud. Seems like a different world, a different city than today’s Buffalo; an economy based on manual labor supplied by various European ethnic enclaves, northward-migrating African Americans whose sons comprised the hopeful contestants in the Golden Gloves. In today’s Buffalo, the most prevalent vestige of boxing culture appears in office workers shelling out to fitness clubs and gyms for boxing classes and personal training. Some of the benefits of the total body fitness that boxers endure without getting punched in the face. Or liver. But boxing, the sort where some as young as single digits suit up in reds and blues, headgear and gloves, persists in a handful of gyms throughout the city. Most are limited by financial resources, gym availability, trainer and sparring availability, and usually all of the above, resulting in tribal disputes among trainers, gyms, and fighters over the crumbs. Buffalo Boxing Club opened last year with a mission to change all that and offer Buffalo boxers and trainers a space to work on their craft in a large storefront on Elmwood Avenue in Kenmore with little else besides an elevated ring, heavy bags, the national flags of some of the members, black-and-white sticker posters of classic fights, and a water cooler. On a recent weekday night visit, around 20 people from almost every walk of Buffalo life were hanging in the gym, working out, and getting in some sparring. A very loose vibe in the gym, lead by its relaxed owner, Joe Mahiques, who invested in the club and the sport locally as a hobby. Business with his main endeavor—Allentown Pizza—was going well, but he had a dream to give area boxers a training experience above what they’ve been able to access. Four fighters who regularly train at the Buffalo Boxing Club are set to compete in the Golden Gloves. Splitting time between the Kenmore club and the longtime gym in the Northwest Community Center is 16-year-old Diaa Zabadani. 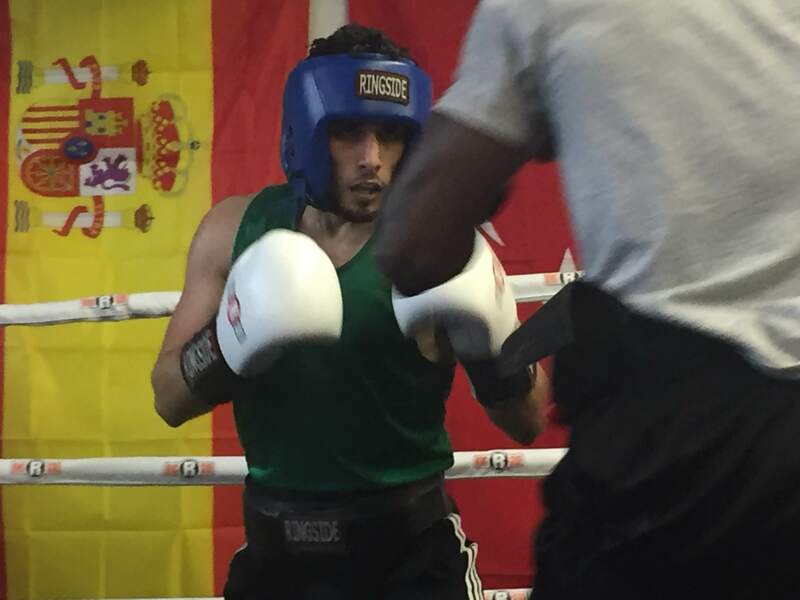 Resident of Black Rock by way of Damascus, Syria, Zabadani found his way to boxing through the principal at Lafayette International High School, John Starkey, who established a boxing program with several area gyms. Zabadani said he’s the only one of 50 still active in boxing since the program started in November 2017. A sophomore currently, Zabadani says he’s at the top of his class with a 99 average, and wants to study international law. “He’s the best guy in the world,” Mahiques kept repeating about Zabadani. Faulise came to Buffalo Boxing Club from another area gym with Erin Hoflich, a precious metals commodities trader by day, who both dig the competitive, collegial atmosphere of the gym. “I just feel like I have a great time when I come here and work out,” she said. “Like everybody’s here to work towards something and you just feed off of that. Everybody helps each other out. Right. And I feel like there’s no judgment. Like you’re just here to learn and do better.” Hoflich, with an 0-4 record in amateur fights, is entered in the Gloves for the first time and hopes to get a fight if there’s a match at her weight. In the gym trimming down to 114 pounds is a young man primed to assume the mantle as one of the best pound-for-pound amateurs in the tournament, which draws fighters from throughout Upstate New York, Samir Alowbali. Alowbali’s family is part owner of a former corner store that recently expanded into a 12,000-square-foot supermarket at the corner Bailey and Kensington avenues, where Alowbali puts in 10 to 12 hour days, trying not to eat too much of the food he prepares as he ramps up his training. The attendance at the Gloves on January 27 won’t be anything close to what it was in 1947, but it still offers a similar experience: bite-size slices of present Buffalo lives challenging themselves and putting it all on the line in pursuit of a dream.